We are still awaiting our first gannet chicks of the season but, with news that a chick was spotted by Maggie on a landing trip, it won’t be too long before we see chicks on our Bass Rock cameras. Also, news of the first puffling of the season on the Isle of May following the sighting of a puffin returning with sandeels in its bill. 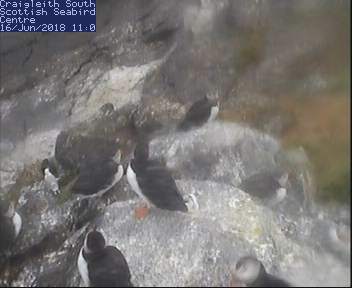 We hope to see the same behaviour on the cameras which will mark the arrival of the first Fidra and Craigleith pufflings respectively. The cormorant chicks on Craigleith are doing well and we had the first gull chicks of the season too, with herring gull and black backed chicks being seen on both the beach and cliff cameras. One or two of the gull chicks have been seen investigating burrow entrances which is a behaviour we have been seeing more and more of on the cameras. Fingers crossed they don’t become too interested and decide to pay the breeding adult puffins a visit! There have been several grey seals basking on the shores of Craigleith over the past few days, much to the interest to many visitors, both in the Discovery Centre and on the boat trips. They appear quite lean so will likely be young grey seals that were born last year.